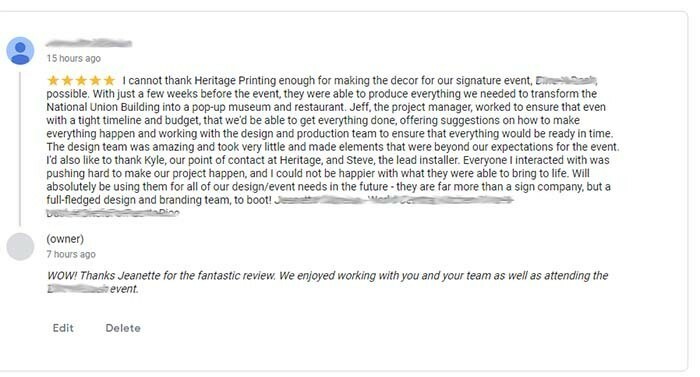 My recent post, in this marketing for printers series, is insightful on how to get reviews and manage them, read the post here: https://heritageprinting.com/blog/marketing-for-print-customer-reviews/. This post follows it with further information on how to respond to your online reviews. As the world turns, so does Google and its algorithm of measuring (which directly impacts all of us). It was no surprise when the big G recently began sending responses to reviews back to the reviewer. For now, when you say thank you or make any comment to a review posted on your Google My Business listing, Google emails your comment to your customer. Why is this important? I believe that it is, because it sends a message that you care about your customer. The big trend G has pushed is E.A.T. expertise, authoritativeness, trust. By responding, you indicate a measure of E.A.T. about your product, service and customers. Timing is important, so monitor your review activity and respond within 36 hours when possible, weekends and holidays excluded of course. A timely reply indicates you are aware of your client and tells Google that too. My average response time, during business hours, is 1 hour or less, after hours is 12 to 14 hours or less. My goal is to respond as quick as possible, I want to stay in front of our customer as long as possible, especially in a positive environment. The tone of your response is critical. I try to stay positive, with a short comment declaring our appreciation for their business. I never advise a confrontational comment. Engaging in a dramatic, online argument never provides any benefit for your business. Mention the reviewer by name in your reply. Everyone likes to hear their name in a positive manner, whether it be in person or online. Personalization has been a staple for print marketing, we call it variable data! Be original, write a unique reply every time. Copy/Paste the same reply multiple times will be seen by Google, reviewers and potential customers, it diminishes the value of the message when you repeatedly send the same response. 4 Star reviews are not a bad thing, some individuals believe perfection is impossible, therefore their absolute best review will be a 4 star. I address these reviewers with a polite email asking what we could have done better to receive the additional star. If the customer is responding, we try to incorporate their suggestion, then I’ll email them back, asking if it’s possible to have the review improved to a 5 star. I never ask twice, too many attempts to rectify only irritates, so once is enough. If your interaction with this individual is less than perfect, then let it go, he/she will not change their mind and you can only damage the relationship. Google has made review replies more interactive, I’m embracing this change and modifying our review system, I believe this is a true benefit, let’s take advantage of it.